Ingredients: Aqua (Water), Sodium Ascorbyl Phosphate (Vitamin C Phosphate), Niacinamide (Vitamin B3), Dimethyl Sulfone (MSM), Zinc Glycinate, Arbutin, Glutathione, Lepidium Sativum (Cress) Sprout Extract, Lactobacillus/Pumpkin Fruit Ferment Filtrate, Ascorbyl Palmitate (Vitamin C Palmitate), Sodium Hyaluronate, Tocopheryl Acetate (Vitamin E Acetate), Leuconostoc/Radish Root Ferment Filtrate, Glycerin, Citrus Limon (Lemon) Fruit Extract, Maltodextrin, Lecithin, Passiflora Edulis (Passion) Fruit Extract, Ananas Sativus (Pineapple) Fruit Extract, Vitis Vinifera (Grape) Fruit Extract, Carica Papaya Fruit Extract, Rhodinols (Natural Rhodinol), Inulin, Alpha-Glucan Oligosaccharide, Cymbopogon Martini (Organic Palmarosa) Oil, Anthemis Nobilis (Organic Roman Chamomile) Flower Oil, Rosa Damascena (Organic Rose) Flower Oil, Linolenic/Linoleic Acid, Cinnamomum Camphora Linalooliferum (Ho) Wood Oil, Saccharomyces/Magnesium Ferment, Pelargonium Graveolens (Organic Bourbon Geranium) Oil, Saccharomyces/Copper Ferment, Saccharomyces/Silicon Ferment, Saccharomyces/Zinc Ferment, Saccharomyces/Iron Ferment, Jojoba Esters, Juniperus Mexicana (Cedar) Wood Oil, Eugenia Caryophyllus (Organic Clove) Bud Oil, Phenethyl Alcohol, Potassium Sorbate, Ethylhexylglycerin, Sodium Bisulfite, Disodium EDTA, Alcohol, Alcohol denat., Phenoxyethanol*, Citronellol**, Geraniol**, Linalool**, Eugenol**, CI 77491 (Iron Oxides) * We do not use phenoxyethanol as a seperate preservative. It is found as a component of one of our actives. ** Natural component of essential oils. 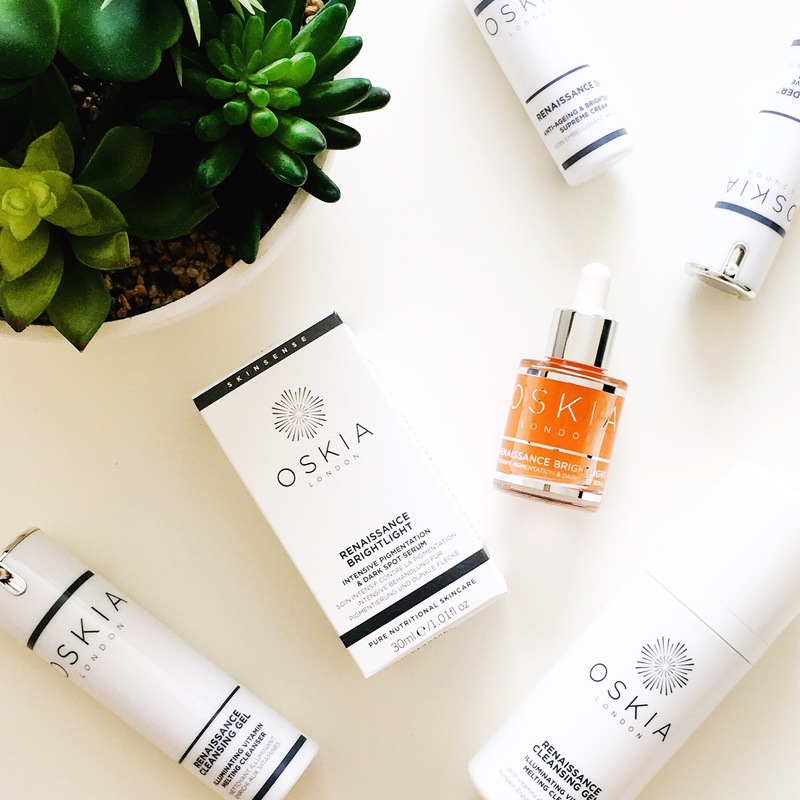 When I first heard that OSKIA, one of my all time favourite brands, were expanding their brilliant Renaissance range to include a moisturizer (review here) and serum to go along side one of my all time favourite cleansers, it was just the news I had been hoping and wishing for. I had previously wrote to the brand more than once asking for those exact two products so I can’t begin to tell you how excited I was about these new additions. I was lucky enough to get a pre-release sample of the moisturizer in last year’s Cult Beauty Goody Bag but I only just got my hands on the serum last month and since then it has been total love. It was hard not to write a review of this sooner as so many of you were asking about it, but since this is a product meant to impact visible change on the skin, I wanted to give it time to actually do that and I can safely say that it definitely lives up to it’s claims and is now one of my hero products. Renaissance Brightlight was created to address the melasma founder Georgie Cleeve developed after the birth of her second child and what they came up with is a supercharged serum packed full of impressive ingredients including 13 brightening actives that target hyperpigmentation in not one but five different ways. It slows down the process of melanin transfer, inhibits the enzyme and peptide-hormone that causes melanin production, exfoliates and removes existing melanin, reduces post-inflammatory hyper pigmentation commonly seen with acne and finally binds copper to prevent it being used to produce melanin. All these elements work together to create a serum that will intensively correct and combat all forms of over active melanin production resulting in a bright, even skin tone and I can tell you from experience – it works. It comes in a small glass bottle with a pipette and the opening is designed in a way that vastly reduces the amount of product on the outside of the dropper and I really appreciate that because it means less waste. It has the same pale pinky-orange colour as the cleanser and the same delicate rose and chamomile scent as the moisturizer. The texture on the other hand is very different, even to other serums. It is not as thick as a gel but it’s certainly not as thin as a liquid either. It has a very lightweight yet somewhat tacky, gel-fluid texture that applies easily and absorbs quickly. The only slight drawback I have found (which a few others have mentioned too) is that if you don’t give it at least 30 seconds to dry, depending on what you apply afterwards, it can cause “pilling”. I find that the best way to apply it is when my skin is still slightly damp from my hydrating toner step – this way the added moisture helps the serum absorb even better and layer correctly with other products. This is not a big issue at all but I thought it was important to mention so if you experience the same thing you’ll know what to do. 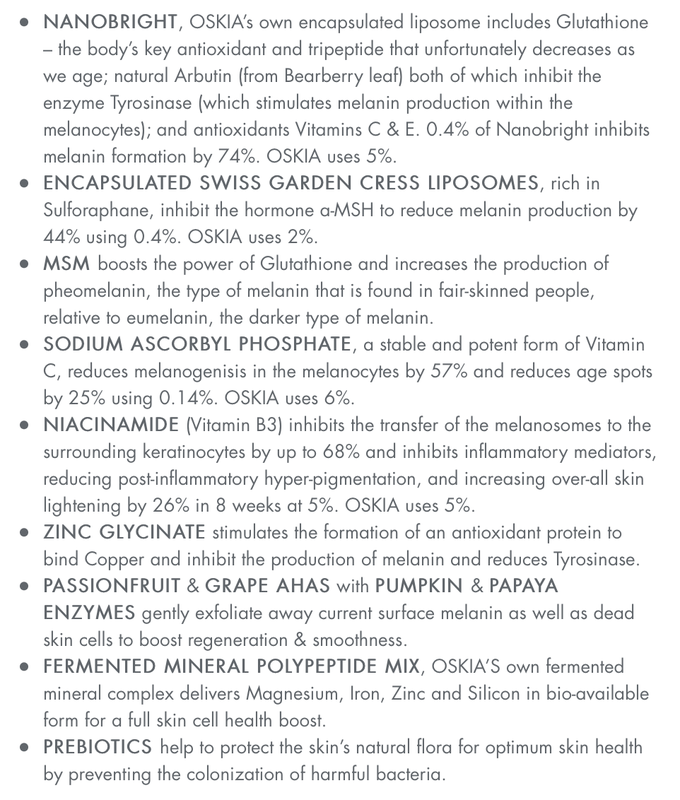 As I said in my previous OSKIA review (here), their website is an outstanding source of information and they go above and beyond to not only let the customers know exactly what is in each product but also why the top ingredients have been included and for some, at what percent (see image below). With this brand you know exactly what you’re getting and I love that. In all the blog posts I have done so far I have never included information lifted straight from a press release or even a brand’s own website but in this case I could not have explained the key ingredients any better than OSKIA themselves and I really think it’s something worth reading because it details exactly what makes this serum so good. I am really happy to see ingredients like Niacinamide (5%), Glutathione (5%) and Vitamin C (6%) being used at levels that will actually be effective because at least you know what you are getting will actually have enough of the right ingredients to do what it claims. This would be an excellent product for anyone dealing with any type of hyperpigmentation and in the right routine would work well with all skin types. It would be fantastic for those with oily/combination skin as I found it has a slight mattifying effect and for those with normal/dry skin this would work extremely well along side the amazing Renaissance 360 Supreme Cream. This should be a summer staple for everyone. It is light enough to be worn during long, hot sunny days and will work along side your sunscreen to prevent and correct any hyperpigmentation before it gets too serious. I have been using this almost every day under my oils and heavier creams due to the season and it has not clogged my pores or irritated my skin and it is definitely going to be a staple in my summertime skincare routine. Before I got Renaissance Brightlight I relied on acids, CAIS and my oils to brighten and even out my complexion and while they all worked very well, with my recent extensive travelling and the poor diet, late nights, stress etc that go along with that, I have needed something more and this is exactly it. This took the results of everything else I was using to the next level and has really made a difference to my skin in the almost 4 weeks I have been using it. That is why I waited to post my review – I wanted to give it enough time to have an effect and show some results before I made any kind of recommendation and thankfully it has 100% lived up to the claims and I couldn’t be happier with it. 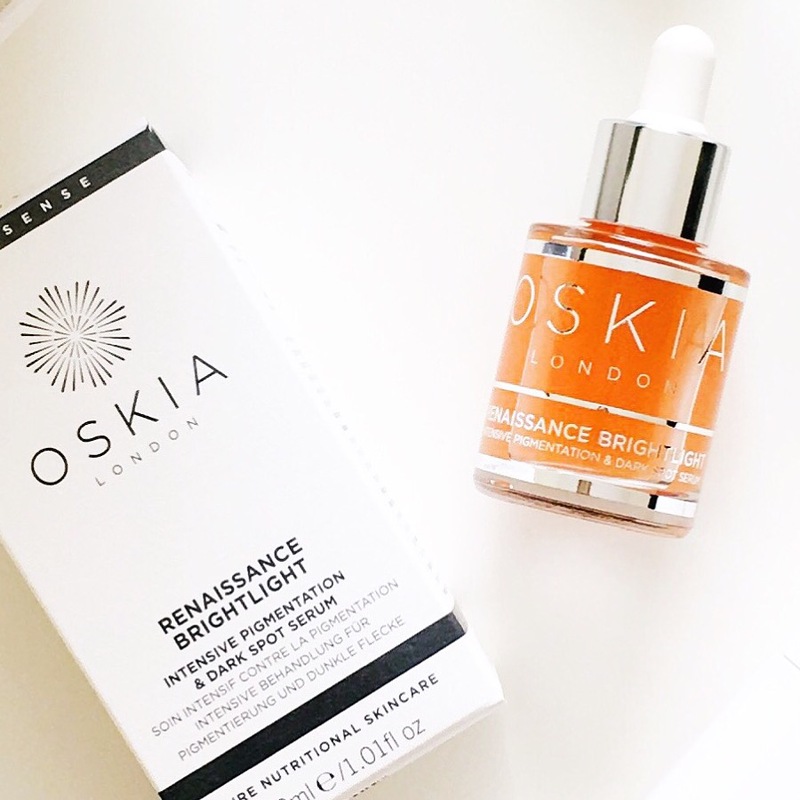 Renaissance Brightlight is £85 for 30ml and available from OSKIA, Cult Beauty (free worldwide shipping), Space NK (free UK shipping) or Naturisimo (free international shipping). thank you for the review, want to know what would you recommend for beginners, the bravura or the oskia. Hi Sharona! You’re so welcome! Can you tell me what you mean by beginners? This serum is very different to the Bravura peels and all do different things. Which products are you specifically interested in and what issues are you trying to address? Well, by beginners I mean that I do not take care of my skin properly, so I never peal it or put mask on it. I am looking for products that will resolve couple of issues, my skin texture, dryness, large pores and hyper pigmentation. What about a good cleanser as well ? Hi, Did you take any before and after photos so we can see? I have tried so many products,& not cheap, for my hyper pigmentation and very few have worked so I am quite skeptical. Hello Natasha! I did not, as I really didn’t expect to see the results I did until it happened lol. I am the same when it comes to hyperpigmentation products, as I have been disappointed in the past, but this one worked so well for me. I know it’s expensive, so you should try the serums from The Ordinary. Have you seen them? I’ve done a post on them and the Niacinamide + Zinc and Alpha Arbutin + HA is a great “dupe” for this as the two ingredients that actually work on pigmentation are the niacinamide and arbutin. I now recommend these too as they’re so cheap and work just as well! P/s is the discount still available? I just came across this blog and I am in awe!! Is the £15 off code still available?